<start_rant> I'm constantly fascinated by the increasing accuracy of recommendation engines across the Web. This includes everything from Amazon's finely tuned (commerce assistance/know it all personal shopper) to the simple "You Might Like.." tag- or topic-based links appearing at the end of many online articles to one of my favorites, the Music Genome Project and Pandora. These solutions provide a never-ending fountain of entertainment and intrigue but often do little to break our habits. I've been spending a lot of time thinking about the nature of how we teach ourselves, track our progress and build our lives into unique paths. Or, how we form online habits. Or habits online. You get the idea. I've been in Austin for the past three weeks as part of the Residency portion of the Code for America fellowship. 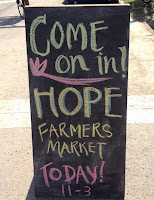 While wandering to the coffee shop today, I fortunately found the HOPE Farmers Market. The thriving, communal atmosphere, along with a few familiar faces, made Austin feel like home for the first time today. I'm not sure I'm ready to move here but it's nice to feel connected in a non-digital way. We're all enjoying the three-day weekend in honor of Presidents' Day after three weeks of meetings, interviews, meetups, happy hours, presentations, special events... you get the idea. I'm not complaining, of course. The place we're staying does have a hot tub!